SACRAMENTO, Calif. /California Newswire/ — Mobilizing state resources to face another year of extreme dry conditions, Calif. Governor Edmund G. Brown Jr. today joined Senate President pro Tempore Kevin de León, Assembly Speaker Toni Atkins, and Republican Leaders Senator Bob Huff and Assemblymember Kristin Olsen to announce legislation to help local communities cope with the ongoing, devastating drought. The $1 billion package will expedite bond funding to make the state more resilient to the disastrous effects of climate change and help ensure that all Californians have access to local water supplies. The Sierra Nevada snowpack, which Californians rely on heavily during the dry summer months for their water needs, is at a near record low. The March snowpack measurement came in at 0.9 inches of water content in the snow, just 5 percent of the March 3rd historical average for the measurement site. The overall water content for the Northern Sierra snowpack came in at 4.4 inches, just 16 percent of average for the date. Central and southern Sierra readings were 5.5 inches (20 percent of average) and 5 inches (22 percent) respectively. Only in 1991 has the water content of the snow been lower. Taking action to further strengthen water conservation in the state, the State Water Resources Control Board on Tuesday voted to expand and extend an emergency regulation to prohibit certain water use, such as washing down sidewalks, and create a minimum standard for outdoor irrigation restrictions by urban water suppliers. In December 2013, the Governor formed a Drought Task Force to closely manage precious water supplies, to expand water conservation wherever possible and to quickly respond to emerging drought impacts throughout the state. The following month, the administration finalized a comprehensive Water Action Plan that charts the course for California to become more resilient in the face of droughts and floods and the Governor declared a drought state of emergency. 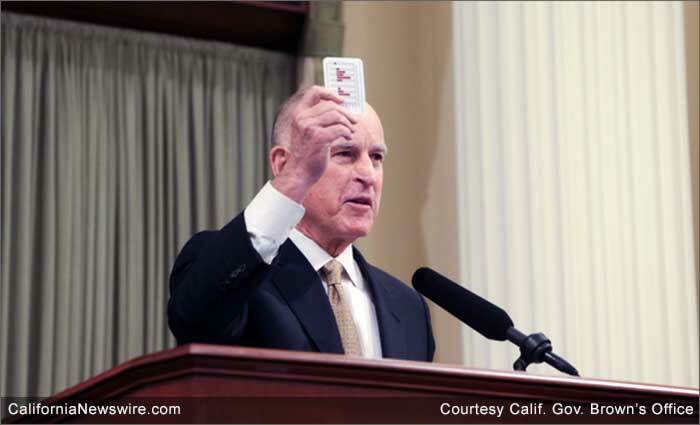 In April 2014, the Governor called on the state to redouble their efforts at combating drought. Last fall, the Governor signed legislation requiring local, sustainable groundwater management as well as legislation to put a water bond before voters, which won bipartisan approval in the Legislature and was approved overwhelmingly at the polls. He also issued an Executive Order streamlining efforts to provide water to families in dire need as the extreme drought continues to grip the state by making funding available through the California Disaster Assistance Act to provide water for drinking and sanitation to households currently without running water.